T54 unveil their début EP Drone Attacks this coming Saturday in Christchurch, this will be the first release for new independent label Gold Sounds. Will Edmonds from Gold Sounds says “Our aim is to help release some of the outstandingly good quality music being made in this city on real life CDs (and eventually, we hope, vinyl) so as to keep the whole physical side of things happening (as opposed to online release only). Just before the New Year Will sent on a pre-release copy of Drone Attacks, I’ve listened to it since with great pleasure and would have written this before had my computer not died a week before Christmas. Not a good time to be rescuing data and resurrecting one’s digital world. T54 start this six song EP with a formidable sound. Guitars, that is. You can listen to it at low volume but you’d be missing half the fun – pop, fuzzed up to a sonic rush, should be listened to loudly – let those vibrations take some endorphins out for a bit of rabble rousing, ok. It is a brave mix to have guitars so loud that they use up much of the harmonic space our ears are capable of swallowing – leaving bass, drums and vocals to follow in the rear. You either have a fuzz-box and know how to use it, or you are an egomaniac forever turning the volume up (actually that can be good too, but that would be another story). Have no fear, T54 are certainly the former. 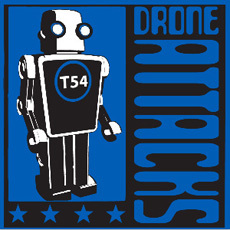 On Drone Attacks T54 fit nicely into my New Zealand Garage playlist, sitting between those Christchurch guitar pioneers from the 80’s, YFC, HDU and of course the Gordons. At times T54‘s angular interludes expand their sound to remind me of other earlier NZ bands like those clever bastards Eight Living Legs (80’s), or, and at their rockin’ simplest, The D4. While guitars may dominate the first songs, T54 and Dale Cotton get more democratic with the mix as the EP moves on; the songs become more spacious, vocals that slithered among the fuzz grow to emerge and eventually take centre stage on the last song Death Drive; which swings from its jaunty rocking intro, to roll on for near on 2 minutes before exploding into a psychedelic grunge match. T54 have been making friends quickly since the infectious Julie K made its sweetly chimed sonic appearance on Chart Disc Vol. 4. (Christchurch Indie Guitar Bands) which I wrote about in September last year, they will play a début Big Day Out show after scoring the remaining slot following last years nationwide search conducted through bNet stations and the Groove Guide. Recorded by Dale Cotton in Dunedin, the album art is by Leo Beckett. You can catch T54 at Whammy Bar in Auckland on Thursday, January 20th prior to their BDO appearance. You can still get demo versions of some of these songs and a few others, including another ripping version of Julie K at Bandcamp. This entry was posted in Music and tagged Chart Disc Vol. 4, Christchurch New Zealand Indie Bands, Dale Cotton, Drone Attacks, Eight Living Legs, Gold Sounds Record Label, HDU, Indie Guitar Bands, Indie Record Label, T54, The D4, The Gordons, Will Edmonds, YFC. Bookmark the permalink.